Walking into a tailor shop, one imagines being greeted by a stylish, well-manicured man. He sports a classic yet chic beard and is dressed in an expensive-looking bespoke suit, complete with lapel pins, cufflinks and a silk pocket square. Stepping into Matthew in Bundang, Gyeonggi Province, a 30-minute drive southeast of Seoul, a different picture unfolds. A tall woman in her 30s walks up to you with a big smile, donning a long dress. She introduces herself: Kang Ae-wan, master tailor of the shop. While it is not easy to find a female tailor who runs her own shop, Kang has been an owner-tailor for over a year. Though she does not give much thought to her gender, there are some advantages to being a woman in the profession. Kang got started in the clothing industry around 10 years ago, working for an online retailer. She was met with skepticism, having studied law in college. With zero experience in the fashion industry, she started her career by dealing with customers. “I really did not have too many thoughts at the time. I just liked clothes,” she said. But she believed in the power of working step by step. Kang moved on to merchandising, then to styling. The next step for her was working at a company that specializes in men’s bespoke suit. She started with measuring the clients. “Men’s suits were more attractive, as it was a field that required study, and it suited me more as I am someone who studies,” she recounted. As she took classes at private institutions and learned the basics, people at work helped her out, recognizing her passion. She learned pattern-making and cutting there. After taking some time off due to health reasons, she opened a tailoring house, as at that point it was what she had done for 10 years. Of course, some were unsure of Kang, as a woman in the profession. She could see the distrust in their eyes. “I have measured more than 7,000 customers. I can see what they are thinking by just looking at their faces. Some leave after consulting, because they don’t trust me. But still, most try to trust me,” she said. 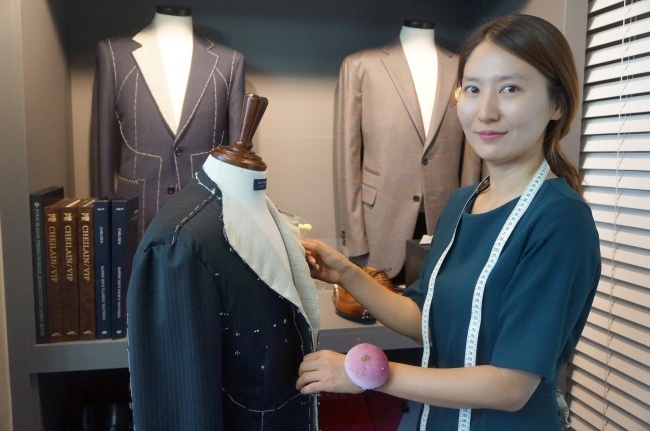 As a tailor, Kang believes that everyone should be able to wear a bespoke suit, especially as more people have “unbalanced” figures. Many people find it hard to fit into ready-made suits. Reflective of her values, Kang’s suits come in a wide price range. The cheaper ones are priced at 350,000 won ($314). 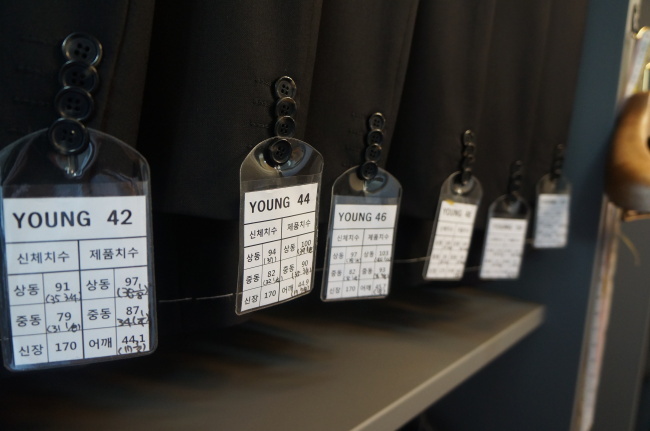 Midrange suits sit at around 500,000 won and those that use imported Italian fabrics are priced at 1 million won. At Kang’s shop, the client and Kang talk about why the person needs a suit and what kind of a suit he is considering. She also asks the client about his lifestyle and what kind of suits he already owns. “Everyone comes to have a custom-tailored suit made so they can wear the right sized one. But ‘right size’ means different things from person to person. Some like their suits tight, others like it loose. It is important to catch what they are thinking,” she said. 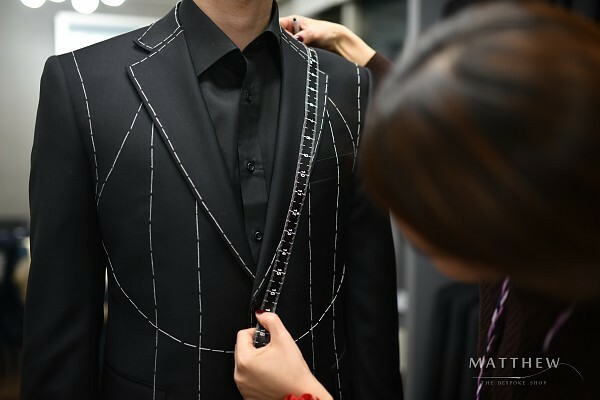 Choosing the fabric, getting the measurements done, a client must visit the shop three times and wait for a month for the fully tailored suit. Kang hopes for more understanding about the process. She also hopes suits can connote a different meaning. “In Korea, there is a sense of coerciveness associated with suits. It is worn because you have to wear it. So there are negative implications to suits and that’s why the business has been struggling in general,” Kang said.